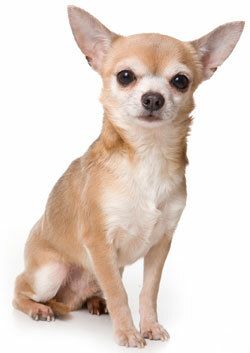 The Chihuahua is 6 to 10 inches tall and weighs 2 to 8 pounds. He has a short coat that is soft and fine on top and has a downy undercoat. His coat can be any color, from solid to spotted black, white, red, cream, chocolate or tan. He only requires an occasional brushing. But you might find yourself brushing him more often to reduce the shedding if it bothers you.